PROPERTY SUMMARY This family home is located in an executive development of four and five bedroom detached houses which were built about 30 years ago. No.11 has been well maintained and improved by the current owners and is well presented with modern en-suite facilities, a family bathroom, double glazing, gas fired central heating, car parking facilities, a double garage and a terraced rear garden. Sitting on one of the most elevated plots within the development, towards the top end of the cul-de-sac the location is ideally suited for the growing family. 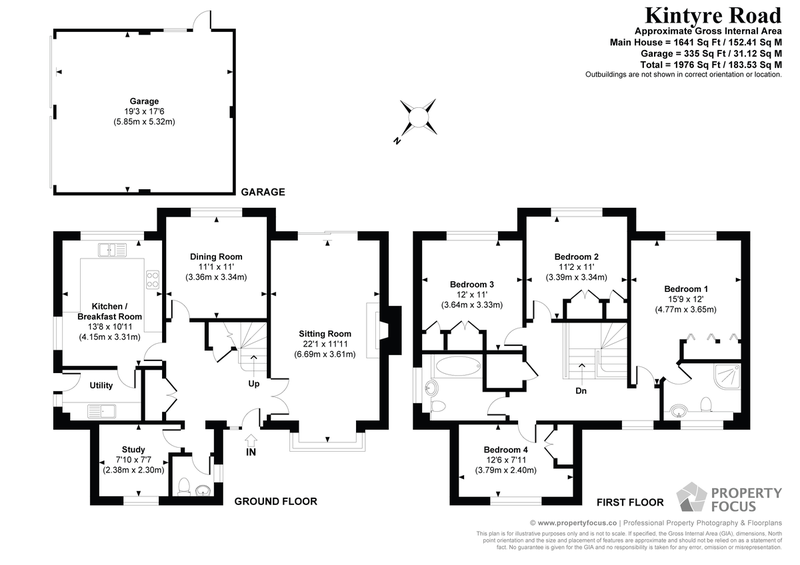 The accommodation comprises; large hallway, sitting room, dining room, study, cloakroom, kitchen / breakfast room and utility room on the ground floor with four double bedrooms the master having an en-suite shower room and a family bathroom on the first floor. Located within walking distance of local shopping facilities and the Queen Alexandra Hospital, with commutable road and rail links easily accessible, this modern detached home is ideally situated for those who wish to capitalise on countryside pursuits and access to the south coast's major cities. Early internal viewing is strongly recommended in order to appreciate both the accommodation and location on offer. SITTING ROOM 22' 1" x 11' 11" (6.73m x 3.63m) Double glazed square bay window to front aspect overlooking garden and driveway with double radiator under, matching oak flooring, brick surround fireplace with coal effect gas fire (not tested), stone shelving to either side and wooden mantle over, T.V aerial point, wall lights, telephone point, double glazed sliding patio door with full height panel to one side leading to rear garden, second double radiator. CLOAKROOM Low level w.c., wall mounted wash hand basin with tiled splashback, double glazed frosted glass window to side aspect, radiator, wood laminate flooring. STUDY 7' 10" x 7' 7"with recess for door opening (2.39m x 2.31m) Double glazed window to front aspect overlooking garden and driveway with radiator under, telephone point, T.V aerial point. UTILITY ROOM 8' 6" x 5' 6" (2.59m x 1.68m) Door with glazed panel to side aspect with double glazed window to one side, work surface with inset sink unit, mixer tap and cupboard space under, washing machine point, ceramic tiled surrounds, matching flooring, radiator. DINING ROOM 11' 1" x 11' 0" (3.38m x 3.35m) Double glazed window to rear aspect overlooking garden with radiator under, dimmer switch, glazed panelled door. FIRST FLOOR Landing with balustrade, access to loft space via extendable ladder (part boarded), double glazed window to front aspect, radiator, doors to primary rooms, built-in airing cupboard with boiler supplying domestic hot water and central heating and hot water cylinder, separate tank and range of shelving. EN-SUITE SHOWER ROOM Concealed cistern w.c., with shelf over, range of storage cupboards and drawers, wash hand basin with mixer tap and cupboards under, double glazed frosted glass window to front aspect, fully ceramic tiled to floor and walls, corner shower cubicle with curved panelled doors, extractor fan, ceiling spotlights, chrome heated towel rail, underfloor heating, panelled door. BEDROOM 2 11' 2" x 11' 0" (3.4m x 3.35m) Triple doored built-in wardrobe to one wall with hanging space and shelving, double glazed window to rear aspect overlooking garden, panelled door, radiator. BEDROOM 3 12' 0" x 11' 0" (3.66m x 3.35m) Triple doored built-in wardrobe to one wall with hanging space and shelving, panelled door, double glazed window to rear aspect overlooking garden with radiator under. FAMILY BATHROOM Coloured suite comprising; panelled bath with hand grips, separate 'Mira' shower over with rail and curtain, fully ceramic tiled to walls, concealed cistern w.c., wash hand basin with mixer tap and cupboards under, radiator, shaver point and light, double glazed frosted window to side aspect, panelled door. BEDROOM 4 12' 6" maximum x 7' 11" (3.81m x 2.41m) Built-in double doored wardrobe with hanging space and shelving, panelled door, double glazed window to front aspect with view towards the Napoleonic Fort with radiator under. OUTSIDE To the left hand side of the property is a gateway leading to pathway providing access to the utility room and garden which is laid to lawn, slightly sloping with wooden fence borders, shrubs, evergreens and bushes. Raised terrace with patio doors leading from the sitting room, steps leading down to garden, trellis style fencing with high brick retaining wall to one side, leading to further patio area, retaining wall and small lawned area with fence panelling. To the front of the property is a lowered kerb with brick paviour leading to tarmac driveway with off road car parking to the front of the garage for approximately four cars, pathway leading to covered porch and main front door with lawned areas to either side with shrubs and bushes, pathway leading to left hand side of property with gateway leading to rear garden with fence panelling to the rear. To the front of the property is a low brick retaining wall with lawned areas and shrubs. DETACHED DOUBLE GARAGE 19' 3" x 17' 6" (5.87m x 5.33m) Twin up and over doors, pitched roof with storage, fluorescent and LED lighting, side pedestrian door with window to one side.